What an amazing opportunity to be included in the Materiality group show at the Center For Maine Contemporary Art. Thank you Bethany Engstrom for curating the show. Read Bob Keyes thoughtful review of the show, which includes a feature on Ian and his piece in the show. A BIG THANKS to Tilly Laskey for including Ian in the group show she curated for the Maine Historical Society in Portland. “Spark! 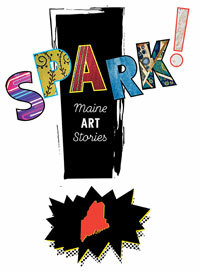 Maine Art Stories” explores the varied ways Mainers express themselves, and features sixteen contemporary Maine artists who are diverse in their geography, their artistic mediums, and inspirations. Read Ian’s contribution to the My Maine Stories network, a participatory storytelling forum run by MHS. Check out Ian’s interview with Nicole Rupersburg on Creative Exchange.